Gator Guards® releases an innovative product in tow hitch protection, the Hitch Guard. Farmington, IL – (October 20, 2014) Tired of hitting your knees and shins? Take the bite out of your tow hitch. 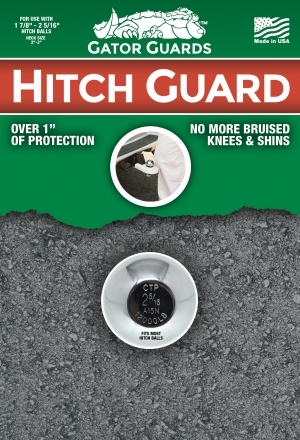 The Hitch Guard is a full coverage, automotive grade polymer cover for single ball hitches. No need to remove for use like conventional covers, or store for fear of injury. A low profile design allows for unrestricted use of trailers and equipment. The Hitch Guard stays soft in all conditions, from -70F to 150F degrees, for year-round protection. Making that treacherous walk behind your vehicle, in hopes the wrong end of the tow hitch doesn’t find you, is no longer an issue! Extremely easy to install. Just slide on the hitch guard to your existing tow hitch and secure the tie. Instant worry-free protection from a tow hitch that seems to find your knee or shin when you least expect it. Fits almost all single hitches. Made in the USA and engineered for a standard ball mount width between 2-3 inches. Available in Black & Glow-in-the-Dark versions for easy identification on those early mornings and late nights. Bruised knees and shins from your truck are a thing of the past with the Gator Guards Hitch Guard. Gator Guards designs, manufactures and markets protection products for the marine industry. Our line of accessory products are designed to be used in a variety of applications in the marine and industrial market. With over 20 years in the business and over 100,000 satisfied customers, we proudly stand behind the best products in the industry. All Gator Guards products are made in the USA and backed by our 100% satisfaction Gator Guard Guarantee. Our feature product lines include KeelShield®, BowShield®, SkegShield®, GatorSkinz® and Hitch Guard. For more information you can visit www.Gator-Guards.com or find us on Social Media.